Dream...Wish...Desire: Wonder Woman...Wherefore Art Thou? The other day I was accused of being Super Woman. Again. 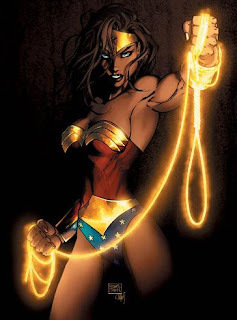 Which caught me quite off guard as it has been a while since I really was Super Woman (or Wonder Woman as what immediately appears in my head at the mention of this other moniker). I was laid up in bed, exhausted after having put in a number of weeks working 80+ hours with the last week being the worst of it. I had been surrounded by people during much of the last month, so when I'm really tired and recuperating, I want my bed, my tv and my isolation. It's probably a factor of being an only child and moving around a lot growing up that I find solitude comforting. It's what I know. So when this friend, who called me Super Woman, let me know he was en route to my location one evening over the weekend...I recoiled a bit...and told him to turn around. It's not that I don't want to see him - he's not local so we don't see each other that often to begin with. It's just that I didn't want to see anyone, or let anyone see me in the exhaustive state I was in. But here was the more deciding reason I gave the response I did...I knew he wasn't on his way to see me because he just wanted to see me and comfort me. He was on his way to see me because he was bored, and I was a nice distraction. He was telling me what I wanted (and needed) to hear, but I didn't have the energy to entertain him, and I was not going to pretend that I did. That's when he went into a spiel about how I'm SO independent and called me SuperWoman and that I needed to make some changes. I won't disagree with that, but I had to laugh. I could still probably stand to make a few more changes in my life that I haven't already made over the last 6 or 7 years. But the reality is, this is SO not me being Super Woman. This is me taking care of me. Period. I'm still Wonder Woman (Super Woman). She hasn't completely gone away within me. She's just learned how to take care of herself when her powers need recharging.